Tune In, Switch off, Prepare. slide one, while sitting at their desk. This makes it incredibly difficult to build a fascinating presentation, because it is done in the same way as an email or a spreadsheet. Here are two tips to take your presentation preparation to a higher level. 20 years ago, I was stunned when my boss shouted this at me. I replied, “It’s only a presentation to the MD about the budget so far. Just a few numbers and bullet points.” Lance turned red and started yelling. Even before the advent of social media and smart phones, Lance was telling me to get away from all distractions, and let my brain work. You can do the same: switch off the phone, leave the email behind, give your mind space to breathe. We all have our method of allowing our brains to free up. Some use Mind Mapping: others draw sketches. My recommendation? The simplest, most creative brainstorming tool of all: the Post-it™ note! Any other method leaves you caught up in the technology. Post-it’s are simple. Write down your thoughts on your presentation subject, in a few words per Post-it, and bang them down on a piece of A3 or a flipchart. When you’ve exhausted your thoughts, you start to group the ideas, remove the duplicates, and look for the core. Almost certainly you’ll come to three key messages you want to communicate. Build your story around those three points and you’ll have a memorable presentation to show. 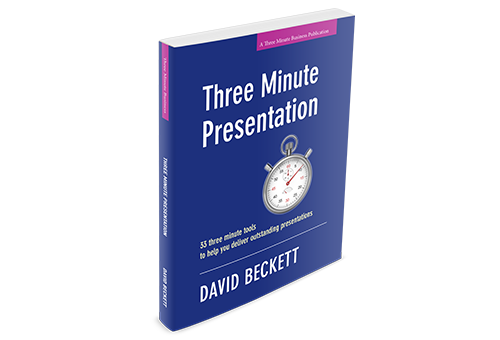 Three Minute Presentation by David Beckett. Find out more here.